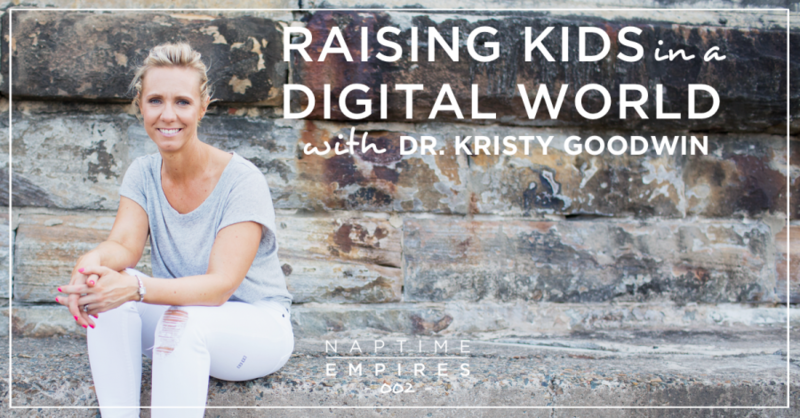 Speaker, author, mum of two – Dr. Kristy Goodwin takes the guesswork and guilt out of raising kids in the digital age. She arms parents with facts, not fears, about the best ways to parent when it comes to technology. Dr. Kristy helps parents ditch the techno-guilt + raise happy, healthy kids who thrive online and offline. We met almost three years ago when she was literally the second person to enroll in my signature program, A Course About Copy® – when I had nothing to show for it but a promise and PayPal link. Since then Kristy’s become not just a dream client and customer, but a dear friend. I wanted our convo to be the first “interview” you’d hear because she’s not just building her own Naptime Empire™, but her empire is directly related to serving US – those of us raising kiddos in this wild frontier of the digital age. Plus a couple of awk / embarrassing pumping stories: air travel edition there at the very end. In celebration of Kristy and her awesome – and in the launch of the show, we’re gonna give away a copy of her book – so make sure you join The Naptime Empires Playground on Facebook for details on how to win! Okay that’s all I got. Without further ado – a convo with the brilliant Dr. Kristy Goodwin.